Fox are no newbies to the helmet game. They’ve been consistently creating and recreating protective equipment for the dirt-focused end of the sports spectrum for decades. 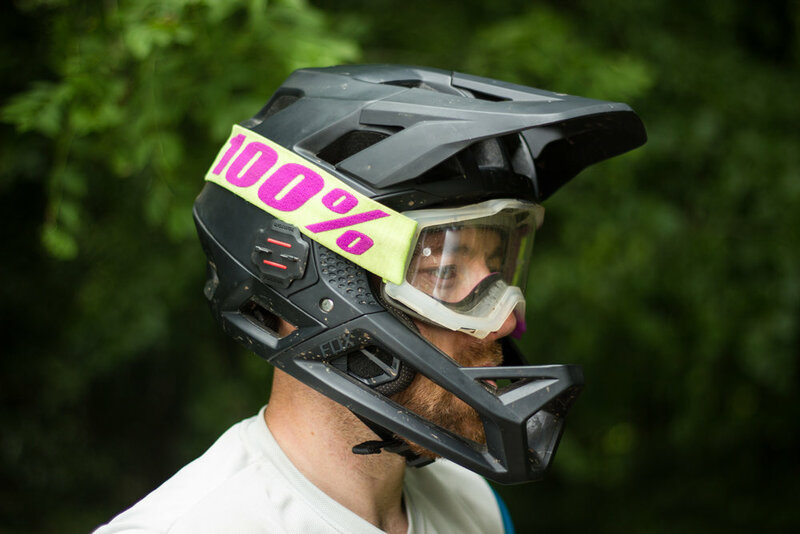 Enter the new Fox Proframe full face lid, designed to fill the gap in Fox’s range and focus predominantly on the ‘enduro/all mountain’ market. There’s a lot of competition in this type of full face these days, which only means good things for us—the punters—as it pushes companies to continue to evolve their products. Weighing in at a svelte 738g, it’s certainly in the right place, weight-wise. With certified DH-accredited status and a MIPS liner, it’s on the money in terms of protection too. Fortunately, I can’t comment too much on its ability to perform said task, however, it did see a few trees which didn’t faze it, or my head! But how does it feel to wear and how does it work, functionally? The sizing is slightly on the big side—I nearly always wear a medium, but mine is a small and it fits great, and I still needed the thicker of the two pad sets supplied with the helmet to snug it up nicely. One gripe is that it lacks a ratchet fit-adjuster, which, due to the possible sizing differences, I feel it could do with. That said, once on, and once the very smart magnetic Fidlock chin strap buckle is connected, it feels adequately stable in use. At this point, I could bore you with the finer details of its construction, quoting all sorts of safety standards, and comment on all the cool colour schemes Fox offers, but what I really want to shout about is its breathability. The Fox Proframe is genuinely one of the most breathable lids I’ve ever put on my head, even surpassing many an open lid for coolness. It’s so good, I’ve regularly worn it on all-day rides, only slipping it off at the same time I would’ve removed my standard lid—you can really feel the air flow through it over your bonce. Goggles fit snugly and securely around it, the face space is more than ample, and the chin bar is nicely shaped and sturdy feeling should you wish to use your teeth as a handbrake! It’s all-day comfy and absorbs the wet stuff well too. Check out the brand new Proframe helmet from Fox, full face, certified and ultra ventilated.